So, I missed the entire month of August, and the first part of September; but I have a good excuse: sometimes real life just gets in the way. Between, being out of town for a funeral, going on vacation, getting married, etc., I have just not had time to blog. So what have you missed? 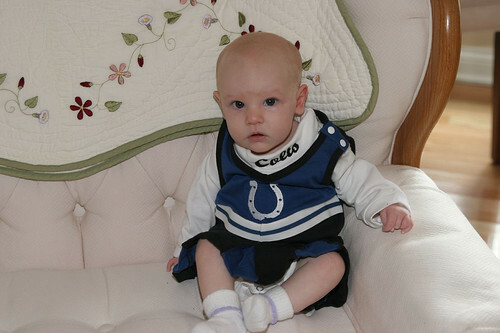 Lily is the cutest Colts fan in the whole world! Photo © Chip Bennett, all rights reserved. She has cut her first two teeth, and can now roll over from front to back and from back to front. She scoots around, holds herself up on her arms, and makes an absolutely adorable effort with all her might to be able to sit up - which she's not quite mastered yet. Today she is four months old! Next, the three of us had our first official family vacation: a Labor Day trip to Gatlinburg, TN, and Asheville, NC. 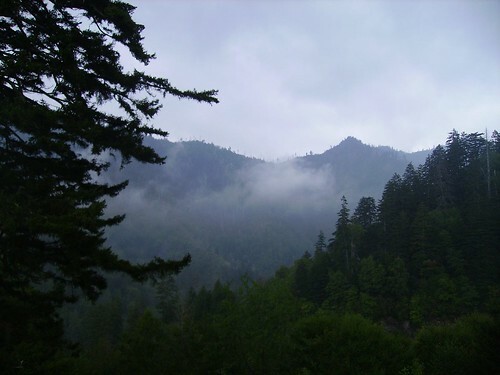 We loved Gatlinburg, and would love to take Lily (and any future children) back to the area. The Biltmore House was gorgeous, but Labor Day weekend proved to be a bit too crowded for our tastes - next time, we'll visit on at a less popular time. Finally, and perhaps most importantly, Stephanie and I were married last weekend at the Gazebo at Williams Park, in Brownsburg, IN. 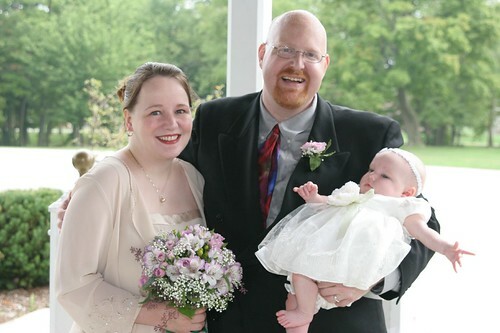 Photo © William Bennett, used with permission. So, that's my excuse. Much has gone on in the world of politics, sports, and everything else about which I usually write. Hopefully I will be able to resume my normally loquacious ways.